Attack 1: [1W] Mysterious Beam (30) Flip a coin. 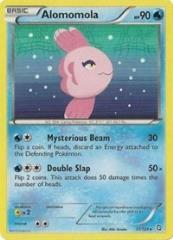 If heads, discard an Energy attached to the Defending Pokemon. Attack 2: [2W] Double Slap (50x) Flip 2 coins. This attack does 50 damage times the number of heads.